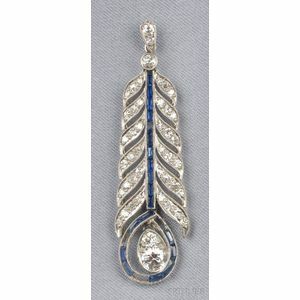 Art Deco Platinum, Sapphire, and Diamond Pendant, designed as a stylized feather set with old single-cut diamond melee, and suspending a pear-shape drop with old European-cut diamonds, approx. total wt. 0.90 cts., calibre-cut sapphire accents, lg. 1 7/8 in., (missing several sapphires). Lacking sapphires in the drop. Stones overall lively and clean.